We’re still in Roatan, but will be leaving tomorrow for Guanaja - the eastern most major island of the Bay Islands. We really haven’t seen much of Roatan because of the weather. We’ve been here 10 day and have only had 2 when it didn’t rain at some point during the day. The winds have been pretty consistent from the east and it blows through several squalls a day including one around 2am. The rain and wind (often over 30 knots) only lasts for about an hour, but it doesn’t take but 3 or 4 minutes in the rain to be soaked. This has kept us boat bound for most of the time. 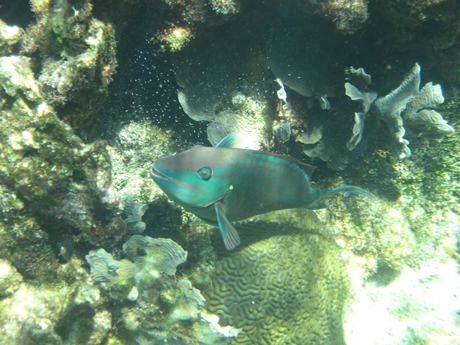 We did get one nice day to snorkel and saw a nice collection of fish and coral including this parrot fish – about the only fish that would sit still for a picture. 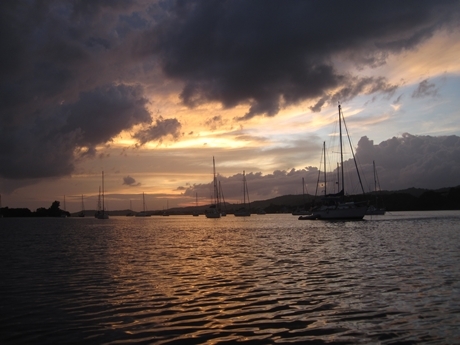 I will say that when the weather is nice this place can be very pretty, Here is the anchorage at French Harbor Roatan – just before or after a rain shower.